In the spring of 1860, Major James H. Carleton led a military campaign against the Pah-Utah Indians of the Mojave River area. On 18 March 1860, Thomas S. Williams and his brother-in-law, Jehu Jackman, who were scouting for a Mormon wagon train from Salt Lake City, were killed in an Indian attack near Bitter Springs. The local ranchers petitioned the government for military protection to keep the Indians away from the watering holes as a form of removing them from this region. 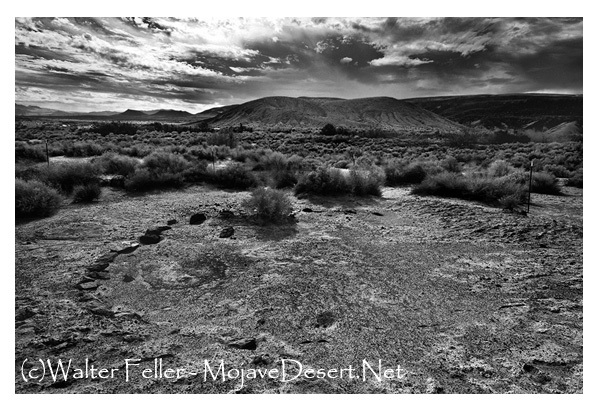 Major Carleton and eighty men built a series of redoubts and camps along the Mojave River. The First Camp Cady was initially built fortified sand and adobe walled structure near the Mojave River. Latter a Second Camp Cady was constructed away from the river edge and a well was used to draw cleaner water, plus it was apparent that a more permanent site was going to be needed. The construction of buildings and a parade field were added. Soda Springs redoubt, first called Hancock redoubt (today called Zzyzx, pronounced: "ziz-ecks") and Bitter Springs redoubts, were constructed between 1860-61. The two redoubts were built as overnight camps to protect both soldiers and civilians in case of Indian attack. The Bitter Springs redoubt was built on 19 April 1860 (on what is now part of Fort Irwin). The sand and adobe structure stood approximately 5' and had a 20’-23’ inner circle. Around the base of the slopped walls on the inside, were steppingstones used by soldiers to rise up over the summit of the wall and fire their rifles, then dropping back down for protection during reloading. Inside the redoubt the soldiers would sleep and cook their meals, placing them out of the winds or harms way. Wagon train travelers rested, filled their water barrels and watered their animals, while the soldiers would stand guard. They would return to Camp Cady after the wagon trains departure. In July 1866, a new mail service was inaugurated connecting San Bernardino, California to Prescott, Arizona over the Mojave Road (formerly the Spanish Trail-Mormon Trail ). The Battle of Camp Cady on 29 July 1866 helped convince the Army and the mail contractors that the Mojave Road was not safe and military escorts would be needed for each mail crossing. The Rock Springs redoubt was built ninety miles to the east and additional outposts were established at other springs along the road. These camps and redoubts represent the first permanent U.S. Army presence in this area. Camp Cady remained in service until 1871.